For 80 years, the Catholic Worker has been on a mission to "build a new society in the shell of the old" through modest acts of mercy. After 14 years of relationship, 12 years of living in New York, 11 years of career, I am striking out on my own… or returning to the fold… or a bit of both. 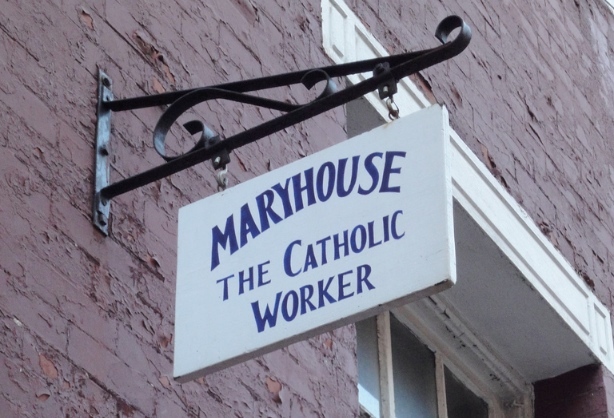 After months of reflection, deliberation, discernment and discussion, I make the big move on Monday, April 5… into a room at Maryhouse Catholic Worker in the East Village of Manhattan. As of next week, I will have left my job (as Senior Program Associate at the New America Foundation’s Arms and Security Initiative) and moved out of a lovely apartment. I cut up a bunch of credit cards and no longer have health insurance. I am not sure what my days will look like. I think it will entail cooking lunch for women off the street, washing a lot of dishes, learning to listen with both ears and without a lot of distractions. Being present and helpful to the women who live in the house (I don’t even know how many people live there right now). For me — in addition to loving my neighbor and trying to perform the works of mercy — that place where it is easier to be good, means a place where I will be invited (and can invite myself) to struggle against boredom (as my mom always told my sister — “only boring people get bored”) suspicion, frustration, alienation, the impulse to gossip, an eagerness to be entertain, and my tendency to fold up on myself and be self-reliant. Maryhouse is the old Third Street Music School. The new music school is on 11th street. The rooms are linoleum-ed and small, with high ceilings — perhaps to best showcase the sound of young violins and cellos. 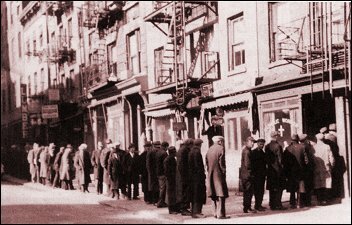 Dorothy Day — one of the founders of the Catholic Worker — lived and died on Third Street. The companion house — and part of the New York Catholic Worker Community — is St. Joseph’s, two blocks down on First Street. They feed and house and care for and learn from men off the streets. I have always been drawn to the Catholic Worker’s peculiar mix of spirituality, study, service and activism. Members of my (almost) community are involved in the New Sanctuary Movement, the War Resisters League, Pax Christi, the Kiaros Community, Witness Against Torture, yoga, music, interfaith work in the community, meditation. They work in solidarity with El Salvador, they travel to Iraq and Jordan and Hebron and Gaza. They grocery shop for shut-ins, visit people in hospitals and nursing homes, run errands and spend hours in the emergency rooms at Bellevue and St Vincent’s. They set up and get people to doctor’s appointments and they navigate labyrinths of bureaucracy with patience, humor and panache, finding or inviting into being humanity in those cold and strange places. I have much to learn from every single one of them. Dorothy Day wrote in her autobiography The Long Loneliness: “I wanted life and I wanted the abundant life. I wanted it for others too. I did not want just the few, the missionary minded people like the Salvation Army to be kind to the poor, as the poor. I wanted everyone to be kind. I wanted every home to be open to the lame, the lath and the blind, the way it had been after the San Francisco earthquake [which she lived through as a small girl]. Only then did people really live, really love their brothers. In such love was the abundant life and I did not have the slightest idea how to find it.” But eventually she did find it, did build it with others, and it survives her all over this country and in other countries as well. With the benefit of three-plus years worth of hindsight, I can honestly say that the move to Maryhouse was one of the best decisions I ever made. When I moved in, I had no idea how long I would stay. And for the first couple weeks when I did not have a room of my own and was freaked out about bed bugs, I was often convinced that I would not make it one more day. But I settled into a little space of my own, got used to bed bugs and found my bearings. And loved it. Moving into the Catholic Worker, I pruned away some things that I had thought I needed: a steady paycheck, health insurance, privacy, the security that comes with the presumption that tomorrow will more or less look like today and yesterday. And I have added a critical gift — one I grew up with, but needed to be an adult to embrace on my own — community. Community is fertile ground — for the seeds of conscience, for deep roots of faith and practice. Out of this fertile ground and with these seeds — what grows? Acts of goodness, resistance, generosity, creativity, a new vision of the world — one that feels possible and close and ready to be born. Peter Maurin understood this. As he and Dorothy Day experimented with truth and built the Catholic Worker, he insisted on an agrarian element to their community — worker farms. The Peter Maurin Farm in Marlboro, N.Y., provides many of the vegetables cooked and served for the women at Maryhouse and the soup line at St. Joe’s. Being at the Catholic Worker gave me a real world education that I had completely missed out on as a career woman in New York City — even in a progressive organization and from my background. I had lived in New York for 12 years. All that time I have had a heart and a conscience. I have gone to more demonstrations than designer stores, more meetings than movies, more flea markets than fashion shows. I have been arrested at least a dozen times, and organized many more actions and vigils with the War Resisters League and Witness Against Torture. I have given out change and fruit to those who have asked. But there was so much I did not know, that I did not see. I did not know that many of the women who sleep in the shelters get swollen and painful legs — “shelter leg” — which happens because they sleep on chairs instead of in cots and all the fluid gets stuck down in their lower extremities. The men sleep in cots. But the women sleep on chairs. I did not know. It had never occurred to me that women who are homeless would not have a safe or private place to shower. It seems logical, right? If you do not have a place to live, where do you shower? But I had never thought of that before. The shelters have showers — big, public, surveilled places that are often crowded and sometimes violent. Maryhouse has the only shower room in the city where a woman can close the door and be alone. It is nothing fancy; in fact, it is grubby and run down and well-used. But it is precious to the women who come. I am ashamed to confess that it never occurred to me that a homeless woman is anyone other than one of the women I would see on the street, with a cart and bags. She could be the slender young woman at the library, neat and clean, and her backpack just a little too full to be that of a students’. She could be the middle aged woman one cubicle over — the one who seems like such a go-getter and is there early and still working when you pack up for the day, her drawers stuffed with clothes and toiletries. Or she could be the elderly woman, quiet and sweet, who is so devoted to her senior center that she never wants to go home at the end of the day. Dozens of times, I have seen people ask my uncle Dan for a recipe to stave off despair and hopelessness in the face of almost inexorable pain, suffering, institutional callousness and inertia. I think they are looking for the next Catonsville Nine, the next Occupy, the next Pay it Forward, the catalytic thing that will change everything. He does not play this game. He does not prescribe actions for others. Rather, he speaks very simply. He says that he only reads the New York Times about once a week, and he pours over the Catholic Worker newspapers that come in from around the country and the world. Reading about the modest efforts of earnest, real and imperfect people to care for their neighbor, feed the hungry, clothe the naked, visit the prisoner, care for the sick, bury the dead in their midst, to see Christ in each person — this is the news that lifts his heart and gives him the strength to keep going. I moved out of Maryhouse after seven months, headed for New London, Conn., marriage and motherhood. But I adopted that advice as my own. I try to match the bad news in the mainstream media with the good news from Viva House in Baltimore, the Amistad Catholic Worker in New Haven, the Open Door Community in Atlanta, Peace House in Kalamazoo, Mich., and the countless other Catholic Worker communities around the country and the world. So let’s raise a (non-alcoholic) glass to the Catholic Worker and help make a place where it is easier to be good. Thank you, Frida! To celebrate the CW’s 80th, I and a few other Occupy Catholics picked up some Catholic Worker papers from Maryhouse and handed them out, along with some OWS journals, at the labor and immigrant rally at Union Square — 80 years to the day after Dorothy did the same thing. Afterward, we partied in the Maryhouse auditorium and sang the most beautiful songs. The trouble is, it’s so tempting to just keep reliving and re-enacting what Dorothy and Peter did, a little harder to think of what they would be doing now. I love that phrase, “a place where it’s easier to be good.” I think of that in every home I live in, and every organization I’m involved with: how can we create a space where it will be easier for more people to be good? Hey Nathan, My friend Mark Engler’s brother Paul tried to answer that question– I think– about what would Dorothy and Peter being doing now by helping to start the Center for the Working Poor… I don’t know alot about it, but it seems like a place to learn more about. He’s staying at WNV headquarters this week! But all things considered, I really do have to say, the New York Catholic Worker is looking pretty damn good for 80 years old. Thanks for the article, Frida. Thank you Frida for this wonderful, sobering and celebratory reflection on your journey into the wild graces of the Catholic Worker movement. I spent five years at Maryhouse and have some marvelous and frightening memories that are all embraced by the ever widening circle of a “harsh and dreadful love” as Dorothy so often quoted from Dostoevski. I would like to contact you for an important request for a book I am editing about GBLT people and their friends in the CW movement. My email address is mharank@yahoo.com. Hope you can be in touch. Thanks again. I have fond memories and some stories to tell you about your father and Dorothy. Thanks for your good words and work. Catholic Worker communities are the places that give me hope and keep me focused on trying to do good. If one is to drop out of mainstream society and become a revolutionary for peace, one cannot do it alone. You must join together with other activists into communities of resistance and work together for peace and justice. This makes sense not only as a political strategy, but as a means for personal survival, safety and refuge . The community of resistance is the only place to be. I always enjoy reading about other’s experiences at CW and other communities. I know how difficult and challenging this kind of life together can be; but what might be called the self-centered life is also a very challenging and often a soul-deadening sort of existence for many people. God bless you in your journey. Obliged, Daniel.